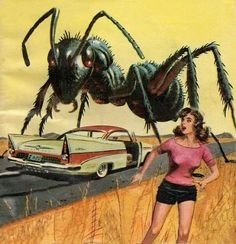 I wish the above wasn’t true, I honestly do, but Oh My God I am in full flow panic mode today, due to what seems to be some kind of personal vendetta against me from the Ant community. It started a day or two ago, when preparing dinner I spotted a wee beastie sauntering along the window ledge, it had been a warm day and I had opened the windows for a while, so perhaps this little fellow was just an opportunist who fancied a change of scene? No such luck. I quickly noticed he brought his mates along, about six of them. I scooped them up on a sheet of kitchen roll and ushered them out into the garden. I rewarded myself for my kindness to all living things the usual way, with a white chocolate twix and returned to the job at hand. But hang on….what was that I spied on the counter top? a bit of movement? Holy Mary Mother of God an army of Ants marching along as if they owned the place! After totally bleaching everything in sight and looking for minute holes that the little B******s could be getting through, we thought we had it sussed, well that was until Daughter number one informed me they were having a soiree in the bathroom upstairs. Paranoia kicking in now. My kindness to all living things has now deserted me totally and I am swearing like a sailor. I am trying everything! Google suggested all manner of natural remedies, they don’t work! these are super Ants! I think they may be mutants! So back to my rather ominous title… I ran a bath this morning after felling another bunch of intruders, yes it does make me feel that dirty! as I finally lay back in what I thought was a safe haven, what did I see floating towards me? Yes indeedy, and where had this horrid little F***** come from? Please God, not my knickers. Previous Article My new addiction…..
ha ha ha love it. An army of ants marching around your house making themselves at home.